Miss V* will be rockin’ a new red, white and blue tutu this weekend and she was in need of a matching pair of bloomers. Thankfully I had a plain white cover on hand. I added some festive fabric scraps was able to make her an adorable ruffle bloomer in less than 30 minutes! Cute, right? This was such an easy (and adorable!) project that I wanted to share the DIY details with you so you can make one too! Finish the edges of each fabric strip. 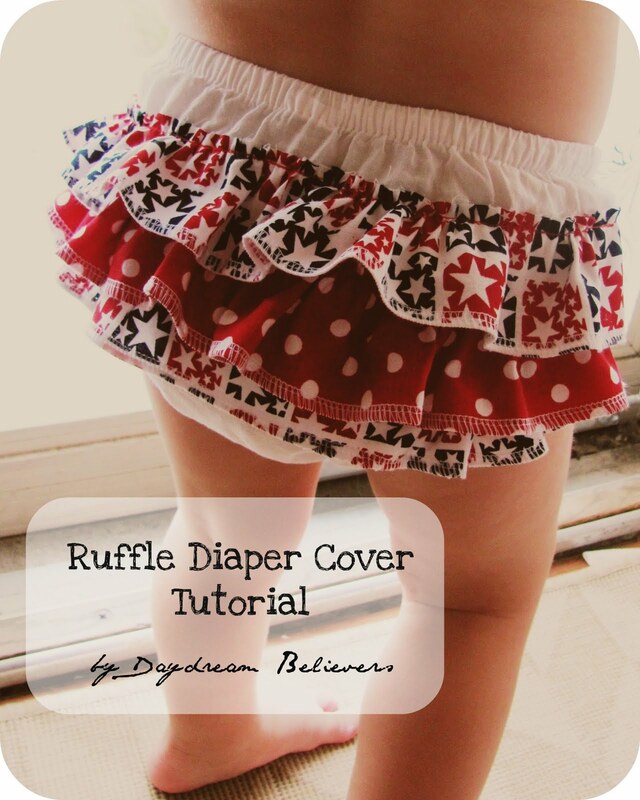 Put it all together...Place and pin your first strip of ruffles across the back of your cover. Be sure to tuck your ends under at the beginning and end of the strip. We are working from the bottom up, so look at the leg opening of your cover, and place your first strip just above this point. Using a straight stitch, sew your ruffle strip onto the cover. Then, position your second strip of ruffles so that the bottom edge of the ruffle sits around the middle of the row beneath it. Pin and sew the strip on to the cover using a straight stitch. Repeat with the third and final strip. That it friends! Easy peasy and oh so adorable! I just saw this over at Tatertots and Jello. SO darling! I'm going to feature it next Friday on my blog! Stop by and grab a button if you'd like. oh my. this is SO cute. I love the serged ends too. seriously. love this. So cute! Thanks for the tutorial! Featuring you on my Friday 5! Have a great weekend! This. Is. Adorable! I have a ten month old, I think she needs some ruffles on her booty! So super cute! I love this. I am having a Red, White and Blue Linky Party that I'd love for you to join in on by adding your link! Absolutely adorable! I featured you over at www.justpleasedaspunch.blogspot.com. Check it out if you get a chance! I love your fabric choice and the fullness of the ruffles. Such a great tutorial. 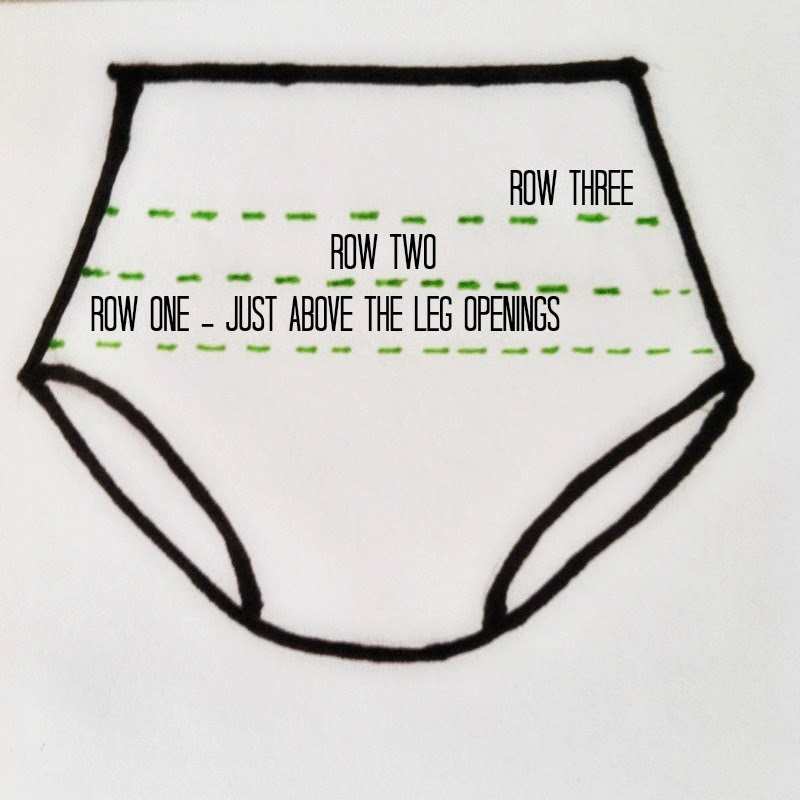 My little girl is almost three and I still have her wear bloomers with some dresses so I will have to try this. Thank you so much for linking up to my Red, White and Blue Linky Party! VERY cute! I need to make one of these! Found it while stumbling. Thumbs up! Hey! Stopping by to let you know I featured this on my blog tonight! Thanks for linking up to Delicately Constructed Friday and I hope to see you around tomorrow!! Hello, I believe your internet site may be possessing browser compatibility problems. When I search at your site in Safari, it seems good but when opening in Net Explorer, it's got some overlapping. I just needed to provide you with a fast heads up! Other then that, great web site! This is so fun! I would love to try this for my grandbaby. I won some fabric at a blogging conference & I've been looking for a fun project to make. Thanks for the inspiration! Thank you for the easy peasy tutorial!